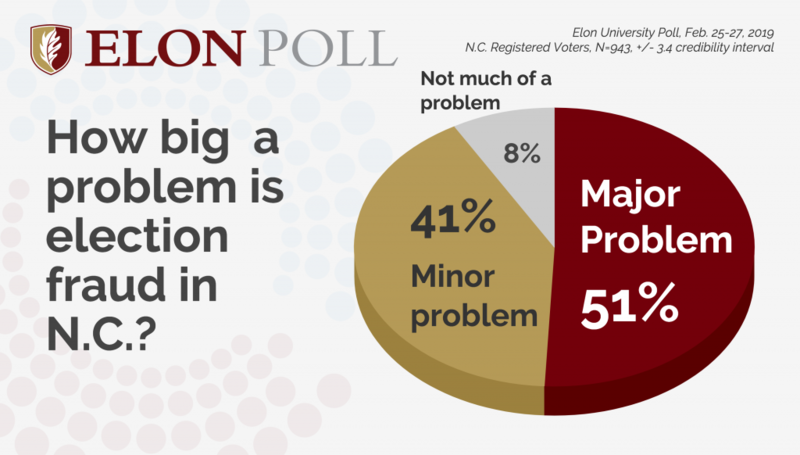 A new poll from Elon University finds more than half of N.C. voters surveyed consider election fraud a “major problem” in the state. Marking nearly a year of planning and progress in Goldsboro, a group of community residents, nonprofit leaders and elected officials that have been part of an initiative focusing on equitable economic development known as WAYne Forward, hosted a Fall Summit to discuss the ways in which the community can address poverty through collective effort. With high energy and deep conversations, the event highlighted the value of sustained work that brings many stakeholders together to promote opportunity for all. These aren’t always easy conversations. A history of exclusion and discrimination that persists in eastern North Carolina creates barriers for current residents, as have policy choices and systems that block opportunity. Problems ranging from disproportionate suspension rates of minorities to disproportionate juvenile court rates and detention admittance rates to the lack of affordable housing and too few good paying jobs with career pathways. As well, multiple census tracts or neighborhoods in the county experience a poverty rate of over 30 percent, delivering what is considered a double burden on residents poor and not poor. Yet, for the past year, the community organized around these troubling outcomes and has been working to understand the landscape of opportunity in their community. Building from community-based outreach such as food drives or school reading initiatives, these are just some of the ways Wayne County aims to bridge the gaps to fight poverty. Along with a continued emphasis on building a strong civic leadership, and grassroots network that can mobilize and organize residents, and a growing effort to revitalize main streets and lift up the arts and regional connections the community has proven assets to build on. Still like many places, Goldsboro has its obstacles to overcome. In 2014, it was ranked as one of the areas with the greatest decline in the middle class by Pew Research Center. 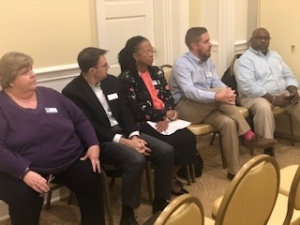 Research by the UNC Poverty Fund released last year found the persistent and concentrated poverty in Goldsboro along with systemic exclusion of communities of color was creating a toxic environment for children. A new study released today by the Institute on Taxation and Economic Policy (ITEP) finds that the North Carolina tax system is regarded as the 31st most regressive because low-income taxpayers are asked to pay more in state and local taxes as a share of their income compared to the rich. The study, Who Pays? A Distributional Analysis of the Tax Systems in All 50 States, analyzes tax systems in all 50 states. The analysis evaluates all major state and local taxes, including personal and corporate income taxes, property taxes, sales and other excise taxes. 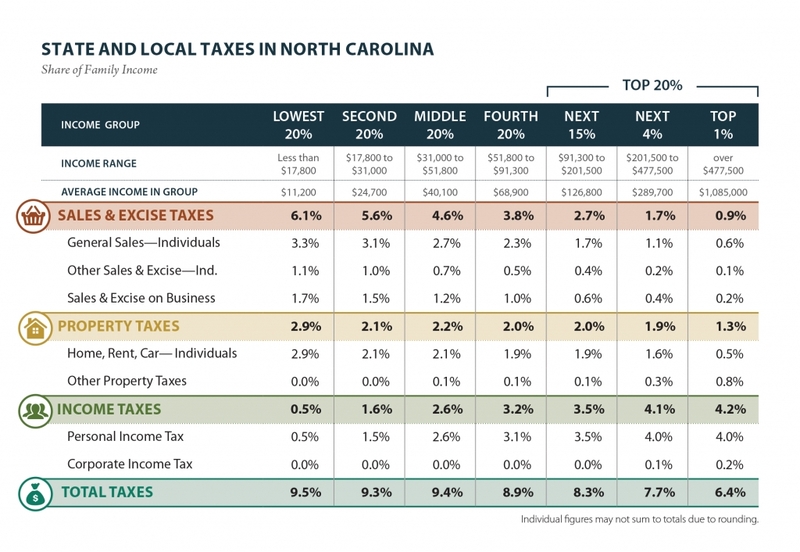 According to their findings, the lowest-income North Carolinians pay 1.5 times more in taxes as a percent of their income compared to the state’s wealthiest residents. 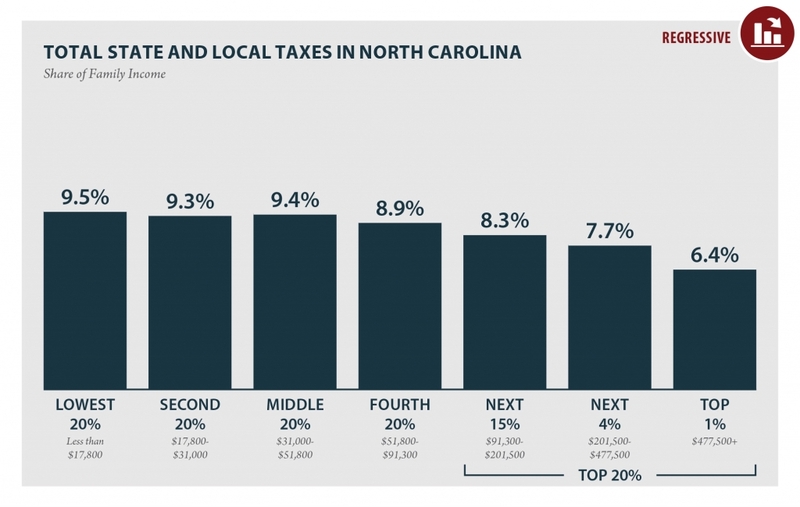 As illustrated below, the lowest 20% of North Carolina taxpayers pay 9.5% in total taxes as a percentage of their income, while the top 1% of North Carolina taxpayers pay 6.4% in total taxes as a percentage of their income. The wealthiest North Carolinians continue to benefit most from our growing economy and the state tax code is supercharging those gains. It’s not unreasonable to ask the highest-income residents and corporations to pay a share of state and local taxes that gets closer to the share that taxpayers with poverty-level incomes pay or that seeks to balance what is now an upside down tax code. It makes certain that those who spend more of their income have more income to spend locally. It is also good for our fiscal position as a state. It turns out, more progressive rate structures are better able to keep up with a growing economy and thus fund the services and infrastructure that support thriving communities. Sales taxes play a critical role in the regressive and consequently inequitable nature of the North Carolina tax system. Like most other states, North Carolina relies on sales and excise taxes (30.7% of the 2018-2019 approved budget) as a primary mechanism to raise revenue. However, in North Carolina, sales and excise taxes are the most regressive taxes when compared to income and property taxes. The lowest 20% of North Carolina taxpayers 6.1 percent in sales taxes as a percentage of their income while the top 1 percent pays less than 1 percent in sales taxes as a percentage of their income. Equally important are the racial implications of regressive state and local tax systems. Tax codes worsen the racial wealth divide when they tax low-income people at higher rates than the wealthy, tax income derived from wealth (e.g. capital gains) at a lower rate than income derived from work, and heavily rely on consumption taxes. A recent study on the Tax Cuts and Job Act from ITEP and Prosperity Now report regarding changes to the federal tax code report similar findings— communities are color benefit the least from tax systems that reward the wealthy, who are overwhelmingly White. Moreover, tax cuts in recent years in North Carolina have consolidated the racial wealth divide by delivering the greatest share of net tax cuts to White taxpayers. State lawmakers have control over how their tax systems are structured. This latest Who Pays data makes clear that our state’s failed tax-cut experiment is maintaining a tax code that privileges the few at the expense of us all. Martine Aurelien is a Policy Fellow at the Budget and Tax Center, a project of the North Carolina Justice Center. Her work focuses on equitable economic opportunities, tax policy, race equity, and systems level policy solutions. President-elect Donald Trump has said he wants to build a wall along the U.S.-Mexican border to keep our southern neighbors out. Pastor Charles L. Worley of Providence Road Baptist Church in Maiden also wants to build a fence, but to keep gays and lesbians corralled behind a 50-to-100-mile electrifed fence to die. Worley’s comments in 2012 put his church near Charlotte on the Southern Poverty Law Center list of North Carolina’s 29 hate groups. The SPLC has also mapped the headquarters of these organizations both nationwide — there are 892 — and state by state. North Carolina’s who’s who of hate includes variations on traditional racist groups like the neo-Nazis, the Ku Klux Klan and the Black Separatist Nation of Islam. There are also relative newcomers, such as Americans for Legal Immigration, which is based in Raleigh. Led by William Gheen, ALI-PAC reared its head about 10 to 12 years ago. The group was particularly active in the mid-’00s, when it found some sympathizers in the state legislature (Rep. George Cleveland, for one), including several that convened an immigration committee. That committee made a lot of noise but accomplished relatively little. The SPLC has received more than 200 reports of hate crimes, including harassment and vandalism, since Election Day.